The grand but elusive idea of the ‘American Dream’ is one of the USA’s gifts to the world. J.S. Ondara is, perhaps, the very personification of this ideal but his darkly poetic lyrics and tender confessionals expose the doubts, flaws and difficulties in chasing the myth, just like the pain to be found in the search for love. This is a timely piece of art, exploring the conflict of an outsider, with a deep affection for its culture and musical history, finding his place in modern America. At times joyous and at times bleak and haunting, Ondara’s inspiring debut album tells the story of his determination to pursue his dream of becoming a musician in a land far from home. Ondara’s obsession with American music began with the bombastic rock of bands like Nirvana, setting him apart from his peers in his native Kenya. After a bet about whether ‘Knockin’ on Heaven’s Door’ was written by Guns ‘n’ Roses, he discovered Bob Dylan and American folk music and never looked back. Where Ondara grew up in Nairobi, instruments were a luxury so his early songs mostly existed just in his mind. But there was an early desire to write and sing and search for himself in music. At the age of just 20, Ondara won a green card lottery, moved to the USA and taught himself the guitar. That journey across continents to embrace American music and deliver ‘Tales of America’ is part of the album’s appeal and the music is inhabited by a wide-eyed spirit of adventure and discovery. Throughout, the instrumentation is sparse; often Ondara’s delicate, plaintive vocal is accompanied just by his gentle finger-picking guitar or fragile strum and is all the more powerful as a result. Other instruments, such as the cello on the beautiful ‘Give Me a Moment’ or the percussion on the more upbeat ‘Lebanon’, are used in subtle, understated ways. 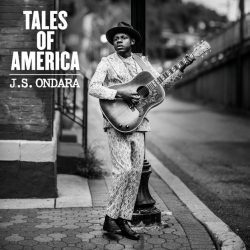 The overall sound is a traditional Americana-folk, but made new and distinctive by Ondara’s fresh, pure voice, gorgeous melodies and strong identity. In searching for the ‘American Dream’, J.S. Ondara has found something that is all his own; but his debut explores the universal themes of seeking love or something indefinable, of the need for acceptance and hope. This is a powerful album, full of integrity and intelligence, offering a great deal of future promise. J.S. Ondara is one to watch.